In 1972 William Cole purchased a fire damaged E-type Roadster from Jaguar. 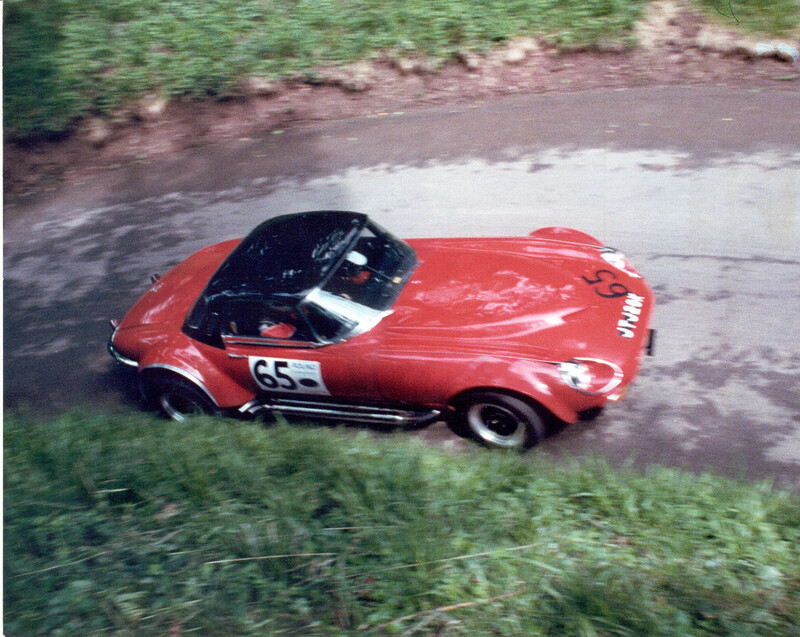 His intention was to re-shell the car and build it as a competition car to contest the British Hillclimb and Sprint Championship.Will said; ” The whole car was dismantled in my garage, a new shell was bought and the wider wheel arches were fitted. 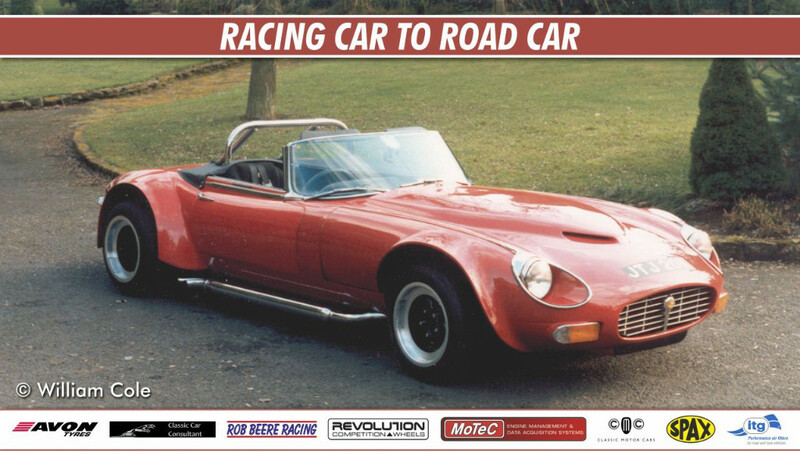 The engine was stripped and rebuilt to a larger capacity of 5.7 litres, with modified camshafts, running on multiple Weber carburettors, prepared for racing by Ron Beattie at Forward Engineering”. During the ’70’s the Jaguar was continually developed. The suspension improved by fellow competitor Ron Hand and ex-Ensign engineer Phil Marks. 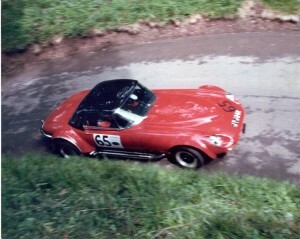 The car competed at Curborough, Shelsley Walsh, Loton Park, Scammonden Dam, Woodvale and Harewood. In the 1980’s the E-Type was further modified by Dave Butcher, enlarging the engine capacity, again, to 6.5 litres increasing performance to 479 bhp, with 470 lb-ft torque. Dave continued to develop the car with further suspension modifications, along with Alan Payne. This transformed the car, with wins at Curborough and Loton Park and a Class record at Brighton Speed Trials, with a flying finish of 146mph! Will ceased competing in the early ’90’s due to business and health reasons, storing the Jaguar in his garage until November 2010. 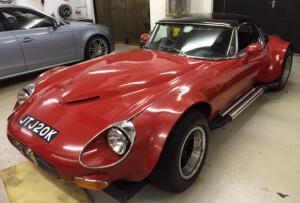 He contacted a local Jaguar specialist with a view to converting the E-type into road trim. The car was transported to the specialist to determine work required, an estimate supplied and the car returned as agreed. Unfortunately, whilst the estimate was prepared, the engine suffered a freeze and a cylinder head was cracked. “I then contacted Rob Beere Racing. Rob and Carl Taylor rebuilt the engine using a Farndon Engineering long stroke crankshaft. Their vast experience has produced an amazingly powerful 7.3 litre engine, with forged pistons and rods, producing 580bhp with 560 lb-ft torque”. 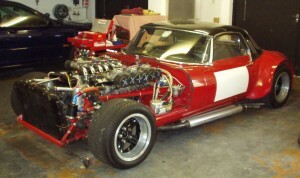 The car runs Jenvey electronic fuel injection, Motec engine management and custom ITG air filters. 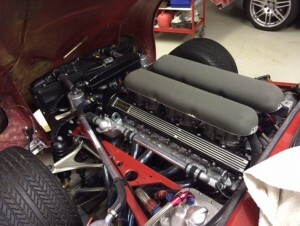 The engine bay was refurbished to a very high standard, by CMC (Classic Motor Cars) of Bridgnorth. Will decided after the earlier issues of sending the car away, the remainder of the rebuild would have to be completed with the car in his own garage, by himself with assistance for the “difficult” bits. 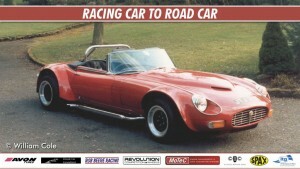 The assistance came from local classic and historic car specialist Paul Myatt (G.H.Myatt Ltd). Paul agreed to work with Will alongside, installing the engine, gearbox and rebuilding the suspension. The last items are currently being completed. The custom ITG filters have recently been fitted, the engine has been run and awaits its’ final mapping. 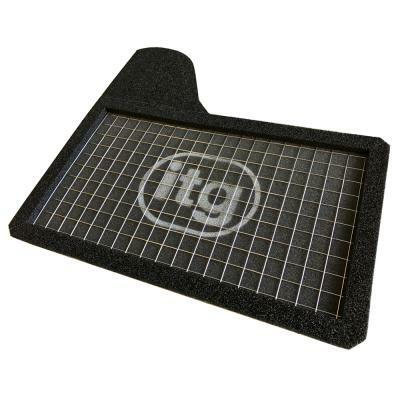 Introducing the new ITG Profilter HMP-895 for the latest 2016 Ford Mustang, 2.3 Ecoboost and 5.0 V8, now available to order. NEW STAFF (and NEW VAN)! 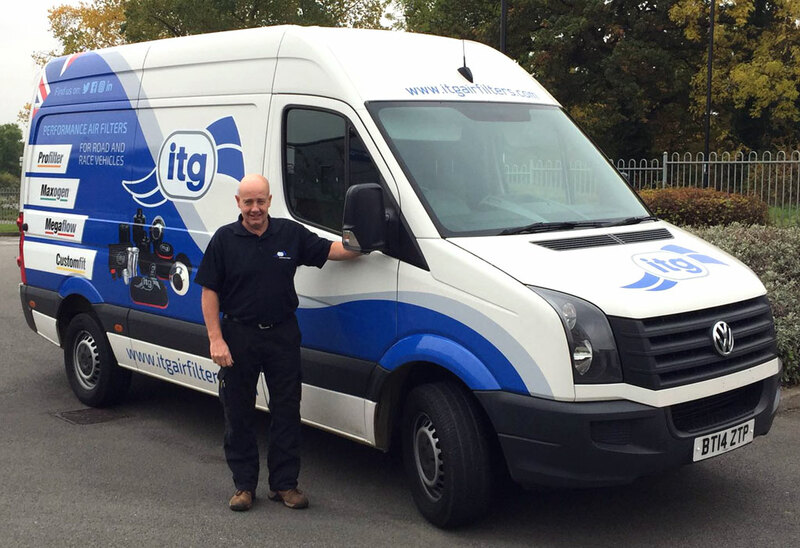 Richard, who is a recent addition to stores, alongside our new van, with livery to match the “new” website. Sam Tordoff (JCT600 GardX backed BMW) was tipped as the quiet favourite for this years BTCC crown. Tordoff had only won 2 races this year, but successfully amassed enough points during the season to lead the title fight. He arrived at Brands Hatch for the Championship finale with an 11 point advantage. Race 1 was won by polesitter Colin Turkington, in a lights to flag victory for the Silverline Subaru BMR Racing driver, following was Handy Motorsports Rob Austin finishing in a season best second place, with Josh Cooks MG, pipping Plato on the last lap for third spot. Race 2 saw an early battle between the two Subaru Levorg’s of Turkington and Plato, before Plato conceded and acted as a team buffer for race winner Turkington, with Shedden taking third. During Race 3, defending champion Gordon Shedden had narrowed the gap to the BMW driver, trailing Tordoff by only two points. At the end of Lap 7, Sheddens Honda Type R held a tighter line through Clarke curve and overtook Tordoffs BMW, finishing the race in third place to Tordoffs’ fifth, which gave the surprised Scot a 2 point advantage and a back-to-back championship title, (his HondaType R aided by ITG filters, of course). Andrew Jordan (Pirtek Racing) won the Independent Drivers Championship and Colin Turkington was awarded the 2016 BRDC Silver Star. It’s easily forgotten Turkingtons BMR Subaru Levorg was a last minute, unproven build earlier this year. Lewis Hamilton ran almost faultlessly from pole, (although severe vibration caused the team concern), to win the Mexican Grand Prix, his 51st victory in Formula 1. Team-mate Rosberg followed to second place with teenager Verstappen third. However, Verstappen was penalised for refusing to let Vettel past after a mistake, leaving Vettel to inherit the final step step on the podium. Vettel was later penalised for his “erratic defending” , against Daniel Ricciardo, who moved up to third. (Vettel is also likely to be reprimanded for his reaction to the “Verstappen incident”, venting his fury in an expletive laden rant at Charlie Whiting, FIA Race Director).